In this week’s Newsflash we cover permission based ‘opt-in’ versus ‘opt-out’ strategies, focusing primarily on paper truncation or suppression methodologies and biller experiences across some of our geographies and industry sectors. One of the key objectives of any electronic billing project is to maximize the paper suppression. The other often spoken about objectives include improved ‘Days Sales Outstanding’, less customer billing enquiries and generally improved levels of customer service. 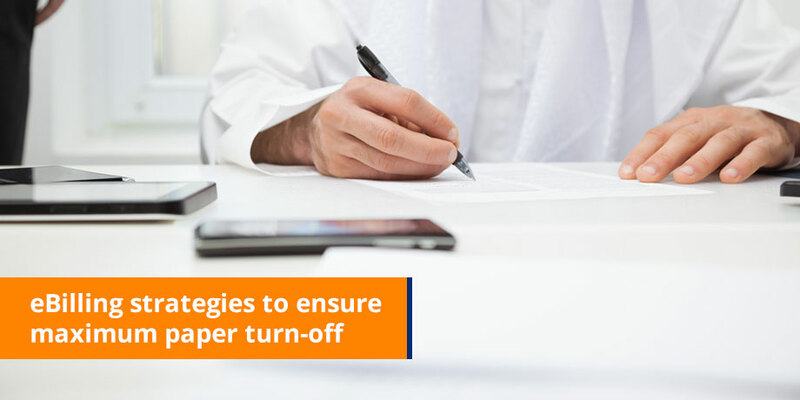 There are three options when it comes to deciding on your strategy for eBilling adoption & paper turn-off. The customer ‘opts-in’ (chooses) to receive an email bill and ‘opts-in’ / chooses NOT to receive a paper bill. This is known as ‘opt-in, opt-in‘. The biller chooses to send the customer an email bill. Should the customer not want it, they need to unsubscribe (opt-out). The customer needs to ‘opt-in’ / choose NOT to receive a paper bill. This is know as ‘opt-out, opt-in‘. The biller chooses to send the customer an email bill. Should the customer not want it, they need to unsubscribe (opt-out). The biller also chooses to stop sending the paper bill once confirmation that the customer has opened the email bill they have received. The customer needs to ‘opt-out’ of paperless billing. I.E. : tell the biller that he still wants to receive a paper bill. This is known as ‘opt-out, opt-out‘. Our experience around the world has shown us that there are significant differences in paper suppression adoption percentages across these three strategies, and absolutely NO difference in customer satisfaction levels. Billers would thus be well advised to go with an ‘opt-out’, ‘opt-out’ strategy. Many billers though, have chosen a combination of the above approaches, depending on the customer segment being targeted. Striata’s recommendation: Choose a meaningful group of your total customer base (10% to 15%), divide them into three groups and pilot the above three approaches. Just over half way through the pilot period (4-6 months), survey each group to determine which strategy has achieved significant paper suppression and improved customer service metrics. Our experience has shown us repeatedly that an ‘opt-out, opt-out’ strategy (with paper suppression once the biller has confirmation that the customer has opened the eBill), is the best path forward. Wishing you a wonderful summer and safe travels if you are taking a well-earned vacation.